This was a 35 year old Velux window that had been leaking for years! I replaced it in a day and made my client, Frank a very happy man. Please see his comments on my reference page. Double glazing does not last forever, if yours has condensation on the inside of the panel this can be from a broken seal. Velux windows are still making the same sizes and the glass can easily be replaced. Please see Richard Piggott reference. This gallery landing only required a small Velux window to create more light. These are oak spinals and hand rails with pine newel. Anytime, is a good time to build a loft, winter or summer. Most clients would like a conversion built in Autumn for a Christmas deadline so why not try January, February and March when the construction business is quieter. Who is a loft converter? 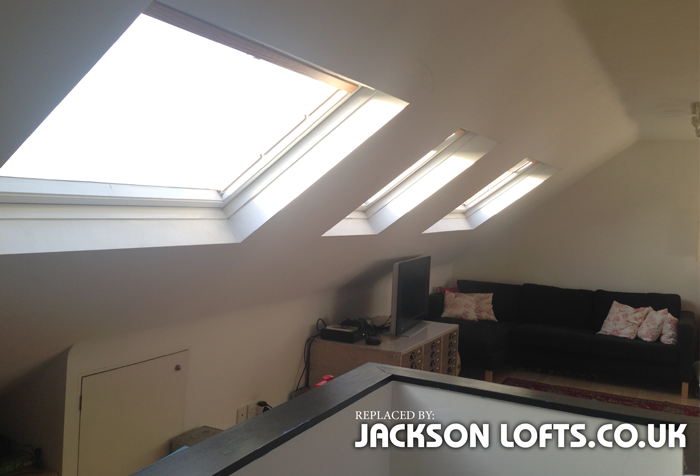 Who is trained and specialises in building loft conversion (transforming an attic space into a room). Following architect drawn plans and completing the build to building regulations. This is due to the complexities of the building process e.g. combining steel, timber and roofing disciplines. Knowledge of building regulations is vital. For a FREE estimate please email Richard through this contact form to organise a suitable time to pop round. See my references, click here.